Fort Campbell, KY – Soldiers, families and friends from 2nd Battalion, 5th Special Forces Group (Airborne), also known as The Legion, gathered together on the morning of September 22nd, 2012, to pay tribute to a veteran and former member of the unit. 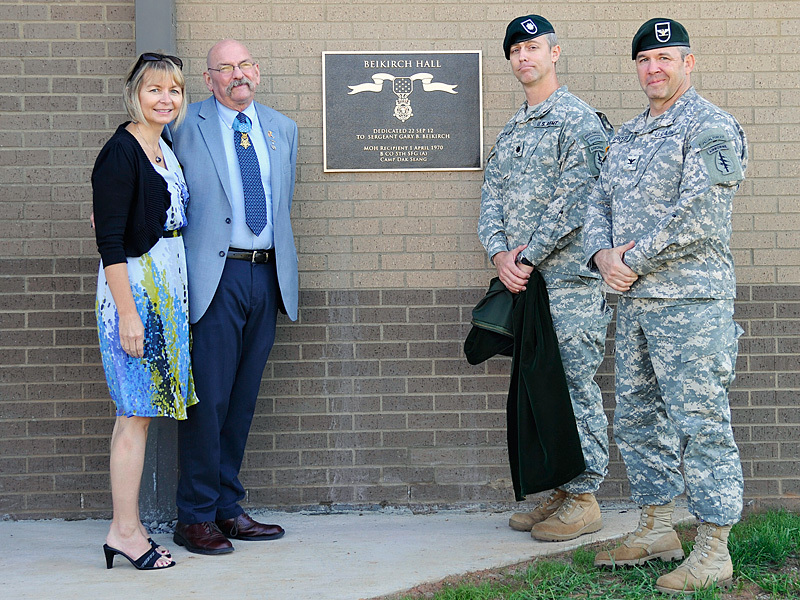 The tribute was in the form of the newly dedicated battalion operations complex, now named Beikirch Hall, for 2nd Bn., 5th SFG (A), in honor of Mr. Gary Beikirch, a Medal of Honor recipient. 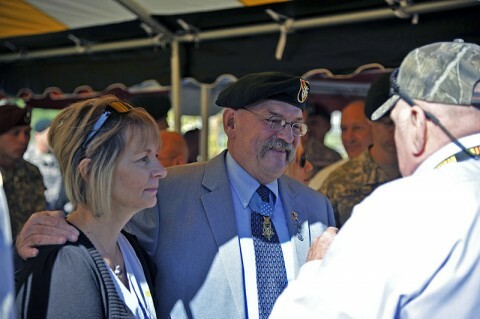 Beikirch served his country in Vietnam as a Special Forces Medical Sergeant. He was part of the 5th Special Forces Group, 1st Special Forces which later became the 2nd Bn., 5th SFG (A). On this September morning, Soldiers stood in formation and listened as the Medal of Honor citation, recounting extraordinarily brave acts taken by Beikirch, was read. A specific portion of the citation, holding special meaning to Green Berets past and present, personified the lengths Special Forces will go to accomplish the mission. A portion of the Special Forces creed reads, “I will not fail those with whom I serve.” Beikirch did just that. He not only saved the lives of the Americans he served with, but the Vietnamese as well. He was a living testament to the culture that prevails throughout the Special Forces ranks. The character he embodied throughout his career, highlighted by his actions on April 1st, 1970, for which he received the Medal of Honor, exemplified the strong legacy established by the members of Company B, and maintained by today’s Green Berets. Even though four decades have passed since combat in Vietnam ceased, the bond forged between the generations of Special Forces Soldiers was built upon a common understanding and ability to relate. The similarities between 2nd Battalion’s mission in support of Operation Iraqi Freedom and Company B’s mission in Vietnam is striking. Company B was tasked with integrating Vietnamese Civilian Irregular Defense Groups, also known as the CIDG, with the Vietnamese army and other governmental units. These groups would work to raise the living standard of the people, develop their identity with and their loyalty to the government, and enlist their active support in defeating insurgents. It also participated in the Mobile Strike Force Command (also known as MIKE force). Its mission was to act a country-wide quick reaction force for securing, reinforcing, and recapturing CIDG A Camps, as well as to conduct special reconnaissance patrols. During Operation Iraqi Freedom, teams from 2nd Battalion developed and mentored Iraqi Special Operations Forces as well as the Emergency Response Brigade to quickly produce a capable Iraqi counterterrorism force. Although these missions were in different parts of the world and in different eras, the goal was the same – to liberate the oppressed. You do not have to look much further in the unit’s history to gain a more in-depth understanding of the challenges the battalion, and specifically the teams, faced. The battalion participated in every major operation since Vietnam. In 1990, the battalion deployed to Southwest Asia to King Khalid Military City with other units of the 5th SFG (A) in response to the Iraqi invasion of Kuwait. For three months the battalion, along with other Special Operations forces at KKMC, was the most forward deployed, isolated U.S. military elements in theater conducting coalition warfare, direct action, special reconnaissance, border surveillance, close air support, and combat, search and rescue. In 1992, months prior to any other U.S. forces, 2nd Battalion conducted operations in Somalia; supporting U.S. and United Nations Forces while conducting direct action, special reconnaissance, and coalition support operations. Throughout the 1990s, the unit conducted missions in Haiti, Bosnia, and Kosovo, as well as contingency operations and training in Northeast Africa, the Arabian Peninsula, and Central Asia. Within a month of the September 11th attacks U.S. forces deployed to Central Asia to confront al Qaeda and the Taliban. Special Forces teams from 2nd Battalion were the first ones on the ground. The unique talents and skills of these Special Operations units would be tapped to penetrate the enemy redoubt and assist the Northern Alliance in overthrowing the Taliban and rooting out al Qaeda. So now, almost 40 years later and surrounded by family and friends, as well as current and former Special Forces Soldiers who had experienced that history firsthand, Beikirch shared his thoughts on what receiving the Medal of Honor meant to him. 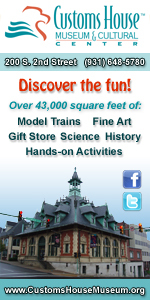 He ended his comments by expressing his appreciation for the honor of having the building dedicated in his name. The dedication plaque, which hangs immediately outside the entrance to Beikirch Hall, serves as a constant reminder to all Green Berets who pass through its doors of what duty, service, and sacrifice truly mean.